One strand of cultured pears. 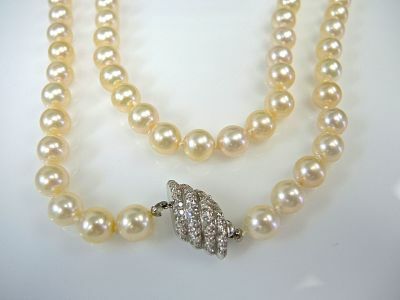 The necklace contains ninety-four cultured pearls of cremy colour with silvery rose and silvery rose and silvery greenish overtones, the pearls are between 8,5-9 millimeters. The 18 karat white gold clasp is set with eighty single cut diamonds (0.92 carats: VS clarity: H-I colour).